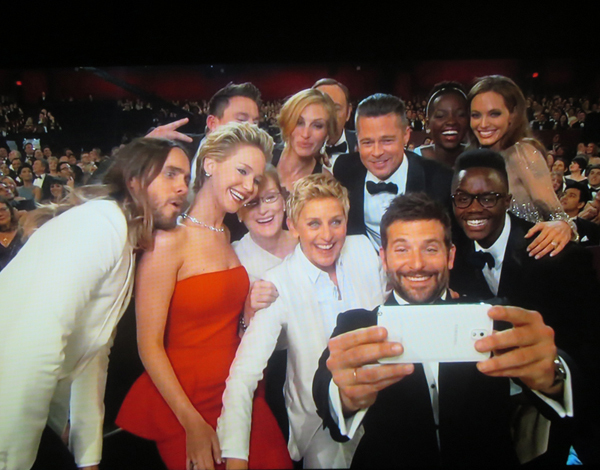 Home » Posts Tagged "Oscar selfie"
I captured a photo of the famous stars with Bradley Cooper taking the famous selfie organized by Ellen de DeGeneres at the 2014 Oscars. Front left to right: Jared Leto, Jennifer Lawrence, Meryl Streep, Ellen DeGeneres, Brad Copper doing the honors (and owning the selfie.) … 2nd Row: Julia Roberts, Brad Pitt, Peter Nyong’o Jr. … Top row: Channing Tatum and Kevin Spacey both partial, Lupita Nyong’o, Angelina Jolie.